It is a pleasure to introduce you to Keimari Burchall, a 17 years old student from Cedarbridge Academy. He has always had a passion for racing. Throughout childhood, he spent a lot of time riding bikes. "I would get excited whenever I heard a bike starting up or if I saw someone going fast", he recalls. Watching races on television has inspired Keimari to race: "It seemed so fun to me that I wanted to try it and so far I have been doing really good." In 2017, he secured the second place title in the Minibike Senior class, regularly battling his competitors for the top position until the very last corner. Spectators are always sure to enjoy some fierce racing when he is on the track. We are keeping our eyes on this young athlete to see where his racing career will take him next. Thank you for taking the time to read this. For an insight into Spark, the youth arm of the Bermuda Motorcycle Racing Club visit www.bmrc.bm/spark. Kymaree Pitt, a ten-year-old St David's Primary School student, enjoys playing outside with his friends, playing football, spending time with his family and riding motorcycles. In 2015 Kymaree received an electric motorcycle for Christmas. "He rode that bike like he was a professional rider" his mother, Samantha, recalls. He quickly mastered the bike and neighbors would ask if he rode at the race track, though he had not yet received any formal training. Kymaree was a true natural when it came to riding, and eventually racing. In November of 2016, Kymaree tragically lost his father to a sudden death. His mother remembers that "this made him very sad. In February of 2017, his Godpa [Shannon Simmons] signed him up with the BMRC which made him happy." His newfound sport brought a level of joy back into his life. As a talented rider, Kymaree skipped the beginner class and joined the advanced group, progressing with ease. His determination led him to place third in the Minibike Junior class in his debut race season. Kymaree has been racing for just over a year now. "He can also ride a 50cc rental, only on the tracks of course" jokes Samantha. He is one of several students now mastering the club's newest fleet of Oleander Cycles sponsored Youth Riding Clinic scooters. Kymaree's passion for training and racing is undeniable, and he is looking forward to the next level of development with his peers in California next weekend. Since he was 3 years old, Nathaniel has had an infatuation with motorcycles, stemming from his best friend's involvement in motocross racing. This sparked his passion as he'd regularly visit the Southside Motorsports Park with him and watch his races but Nathaniel didn't race until much later on. In 2015, he started riding pit bikes through the BMRC's Youth Riding Clinic. He continued through the program for approximately a year before deciding to race with the club. Nathaniel described his transition into racing: "In 2016, I began to race under the tutelage of Coach Cyril [Whitter III] who taught the program. As a youth with an attention deficit disorder, riding provides a unique avenue to focus on one specific task which has proven difficult in my academic life." Nathaniel excelled and progressed with his racing throughout the season. In 2017 he was awarded the first place, championship title for his category, Minibike Senior, and was further awarded "The One to Watch Award" for his showmanship and persistent riding style. Nathaniel says that "in the process, I have come to know a number of amazing people who support and encourage my endeavors. I am looking forward to this trip and how it can help me grow as a rider." We know that this young and rising racer is bound to make a name for himself both in racing and in life. Norre has always loved adventure and all things thrilling. For his fourth birthday he got his first 50cc motorcycle which he would ride around his yard or on an open field. At age 7, his family was invited to a BMRC Open Track Day where he got to experience the feel for the race track and the world of racing. It was from this point that his passion for riding began. As his passion grew, Norre made an agreement with his mother, Vernisha, that if he could remain on the honor roll at Port Royal Primary for one year he could purchase his own race bike. He was determined to get his bike and worked hard over the next year to maintain his honor roll status and was eventually awarded his new 90cc Pisterpro motorcycle. Norre, now 10 years old, is excited to embark on the opportunity of a lifetime and is looking forward to the upcoming training and race experience in California. Ryan first joined the BMRC family at the age of five and has been loving the experience ever since. The independence, challenge, and thrill of riding has him hooked! Over the last three years, Ryan has continually met and exceeded personal goals, growing as a rider and a young man. Ryan’s love of track and baseball keep him well rounded in regards to sports - but none challenge him the way riding does. His dedication to the sport is continually fueled by a shared love of riding with his father, Alex. His mother, Catherine, believes that "the teaching, knowledge, support and dedication that Ryan and his peers continually receive from the BMRC coaches and team are integral to the development of all of the boys, not only as riders but as citizens of the island." She asserts that Ryan’s experience as a member of the BMRC is no doubt playing an important role in the young man he is becoming: "Riding brings life lessons. Thank you, BMRC!" From the tender age of 2, Jediah’s love for motorbikes had already been realized. Whenever he saw or heard the rumbling of a bike, his whole world would stop, and that would be his only focus. As his father was a mechanic, he was exposed to bikes at a very early age and owned a mini racer from the age of 5. In an attempt to help Jediah live out and develop his passion, his family stumbled across the BMRC - and that’s where the magic began. He found his purpose. During the summer of 2017, Jediah became a member of BMRC and attended his very first Riding Clinic with the club. The rest is history. 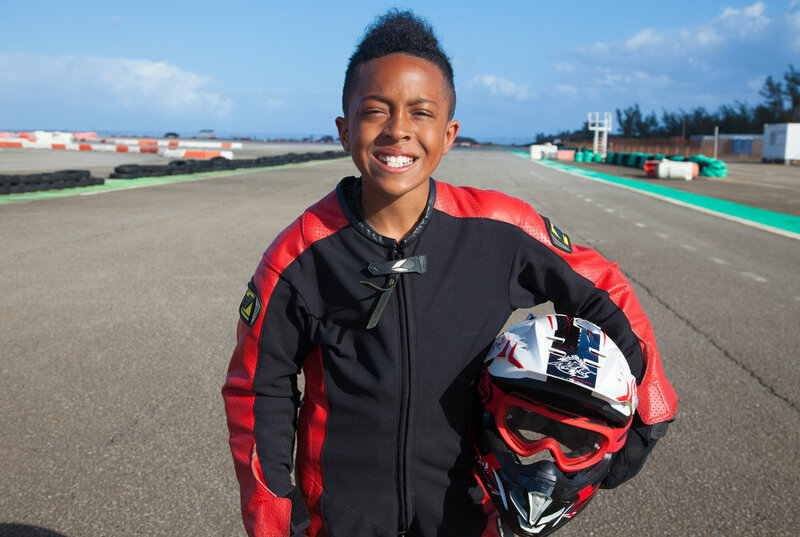 Jediah, now 12 years old and attending Sandys Secondary Middle School, has been presented with the amazing opportunity to broaden his horizons in the world of racing by travelling overseas to California. His mom, Patrina, says she "cannot imagine his life now without this family" and encourages others to "help this dreamer continue to realize his dreams and potential in a sport that he loves. Support the BMRC!"